The BAK Vortrak retracts and rolls up into a spring loaded canister at the front of the truck bed. The cover has a stylish matte finish and can be locked into place in multiple positions. Stylish Matte Finish The Matte finish creates an unprecedented style with durability. 1/2" Thick Aluminum Slats Strong and secure aluminum slats are durable and dent resistant. Rolls up into Spring-Loaded Canister The BAK Vortrak retracts fully into the spring-loaded canister allowing for more bed access when transporting large cargo. Additional Locking Positions Lock the cover in 2 additional locking positions along the rail. Simple Release Cables Open the cover from either side of the truck bed with the release cables. The Vortrak retractable truck bed cover by BAK is constructed of ½" thick aluminum slats that easily glide along heavy-duty aluminum rails that mount flush with the truck bed caps, providing a sleek, low-profile look. When fully retracted, the system neatly stows into a space-saving, spring-loaded canister, and can be pulled out quickly and easily with the included strap. In addition to the fully opened and closed positions, the Vortrak can be locked into place in two additional locations of your choice. The Vortrak can be installed easily with our easily clamp-on design. Made in the USA and comes backed by a 2-year warranty. 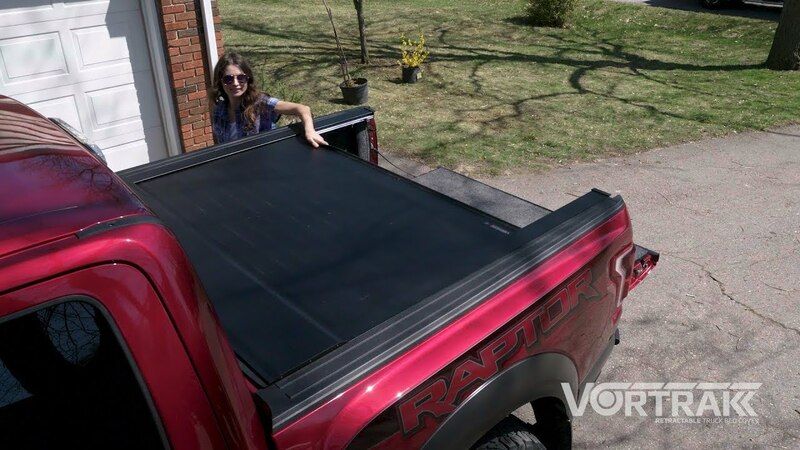 The BAK Vortrak tonneau cover can be installed on your pickup in minutes. It has an easy clamp on installation. Each product comes with easy to understand vehicle specific installation instructions. BAK® Industries (“BAK”) warrants your Vortrak retractable truck bed cover to be structurally free from defects in material and workmanship for 2 Year Limited Warranty period from the retail date of purchase. Warranty registration must be on file and/or proof of original purchase (detailed and dated receipt) required for warranty service. Warranty is nontransferable and applies to the original purchaser of the BAK product only.